Are you wondering how to approach the topic of children’s rights with your students? Not sure where to start or lost in a sea of methodology? This handbook will help you. The RIGHT! 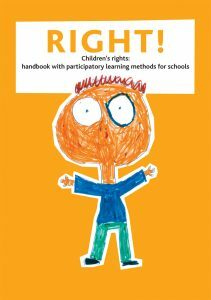 handbook gives participatory and inclusive tools for the discussion of the Convention on the Rights of the Child with elementary school students. It includes games, drama exercises and in-depth critical thinking tasks. The methods in this handbook contribute to the development of 21st century skills in accordance with the Finnish national core curriculum for basic education and are suitable for use in multidisciplinary learning modules. Right! has been prepared in cooperation between Taksvärkki ry and the Teacher Student Union of Finland, SOOL. The handbook has been translated into English with the financial support from the Nordic Council of Ministers and in cooperation with Estonian NGO Mondo. We wish you rewarding and inspiring teaching moments with the Rights of the Child! Download or print the Right! handbook here. One of the games and exercises offered in the handbook is Bingo where participants become familiar with the rights of a child. You can download or print the bingo scorecards (40 different) from here.